The weather last week was so wonderful. We spent plenty of time outside taking advantage of the warmer than normal temps before going into hibernation. One nice thing about living in town is that when the leaves fall from the trees all we have to do is rake them to the road. Don't get me wrong, there are still a lot of leaves and we get sick of raking them all the time but at least we don't have to bag them. 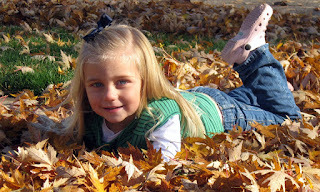 Jenna helped me one morning and had a ball jumping in them, throwing them and posing in them for a picture. Later in the day while playing in the backyard Jenna found a ladybug. 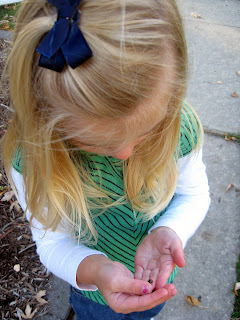 She is fascinated by bugs and will even touch some of them, she does not get this from her mother. She got the ladybug on a leaf and carried it around for about 10 minutes picking it up every time it fell. She must have gotten sick of dropping it so she decided she'd just put it in her hand. That was good for a period of time but then she decided that ladybug needed a home so I went old school and got out a glass jar. 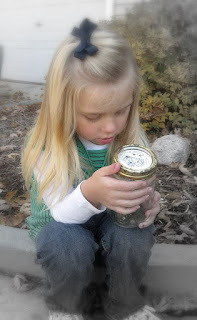 We furnished ladybugs home with some wood chips, grass and a leaf. Jenna watched curiously as the bug crawled around. This tiny bug provided an afternoon of entertainment. When Dave arrived home she was more than excited to share her latest find with him and told him all about how she caught the bug and the home we had made. She then asked Dave to help bring ladybug home, so off the two of them went outside where Dave placed ladybug back onto a branch. 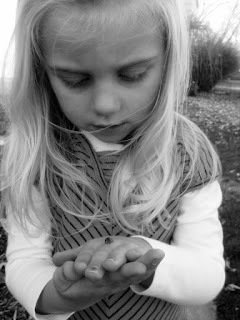 Jenna thought ladybugs friends might miss her if we kept her inside all night....too sweet. I had to tell you these photos are adorable! They look really good. Good work!